Note: This is an updated repost. Last year, I adapted their idea and brought the same holiday fun to our English/Language Arts classes. Here’s how! Depending on your campus, you could do this within your classroom with just your students or you could join forces with another English teacher and/or involve other staff members, such as the librarian, principal’s secretary, and custodians. Students are given one class period to earn a completed turkey. They’ll visit eight stations where they will complete a series of tasks. 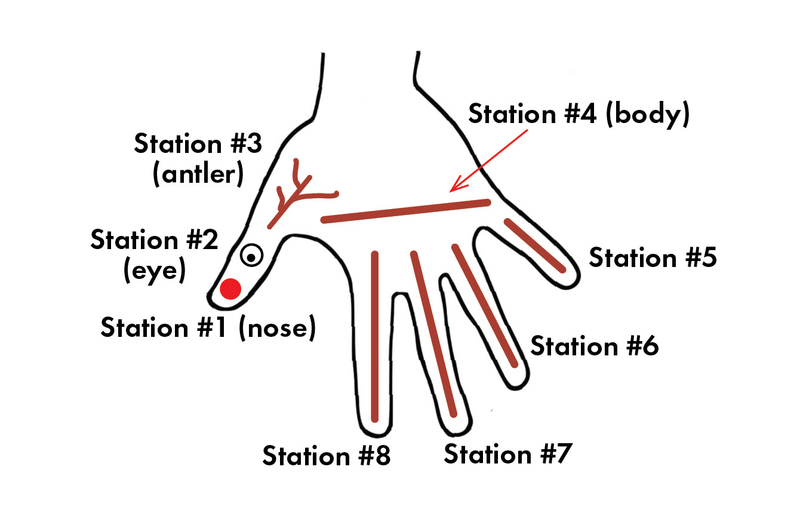 If each task is completed to the station monitor’s satisfaction, students will earn one piece of their turkey (a marker stroke on their hand). To avoid annoying parents, use washable magic markers. Begin by having students number themselves off, 1-2-3-4-5-6-7-8. To prevent clumping, that’s the station number where they begin. As the station tasks are completed, they can hop around to the other seven stations as they wish, working to avoid traffic jams. All eight tasks need to be completed by the end of the period and they’ll need to move quickly to make this happen. Before class, you’ll need to have the materials for the eight stations prepped and ready to roll. 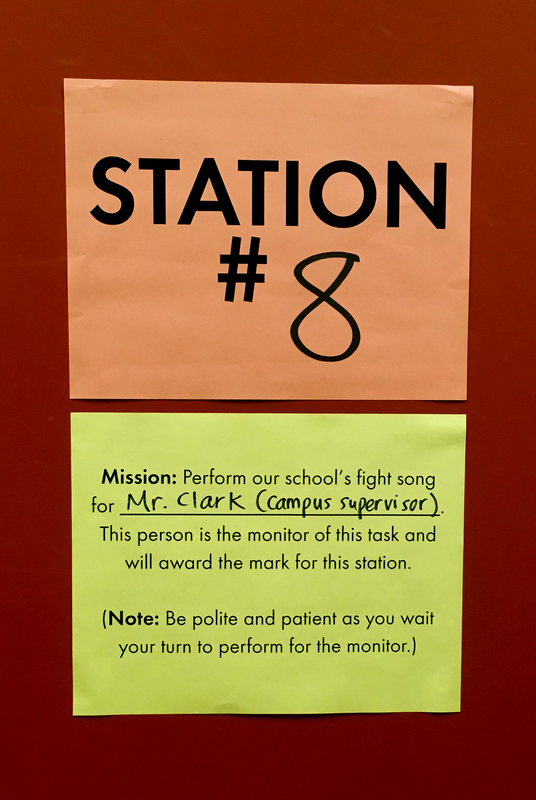 You’ll also need a monitor for each station, a person responsible for checking students’ work and marking their hands. The monitors could include you, other staff members that you’ve made arrangements with ahead of time, student teaching assistants on loan from other teachers, parent volunteers, or student volunteers from your class who will serve as station monitors instead of participating in the race. 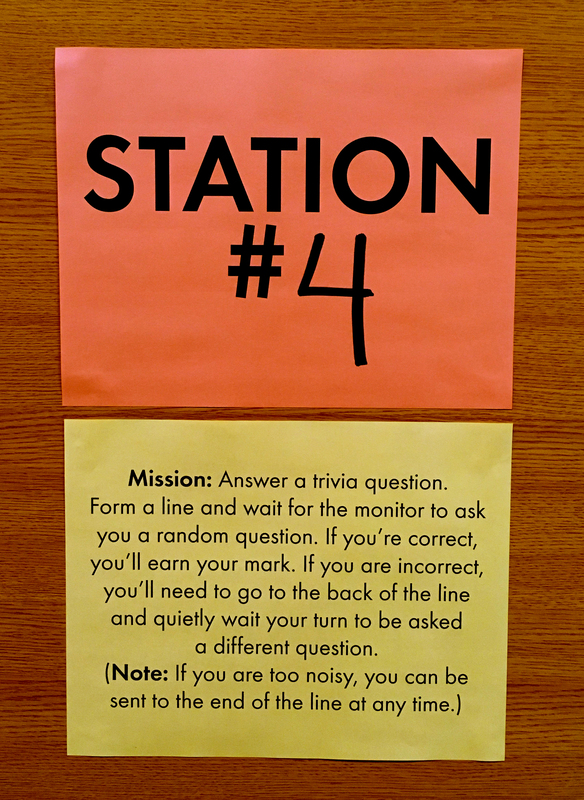 I‘ve pulled together 11 possible station ideas, though you need only eight to run the activity. Choose the ones that are the best fit for your classes. • Name every part of speech in a short sentence. (Note: These sentence slips were designed for my 9th grade students. You may need to create your own sentences if the level is too easy or too difficult for your kids.) Print several copies of sentences that need to be edited, slice them into single-sentence slips, and leave the answer key with your monitor. As a reference tool, I also post half-sheets of my parts of speech posters at the station, but your kids might not need this assistance. • Write a sincere thank-you note to a teacher or staff member. 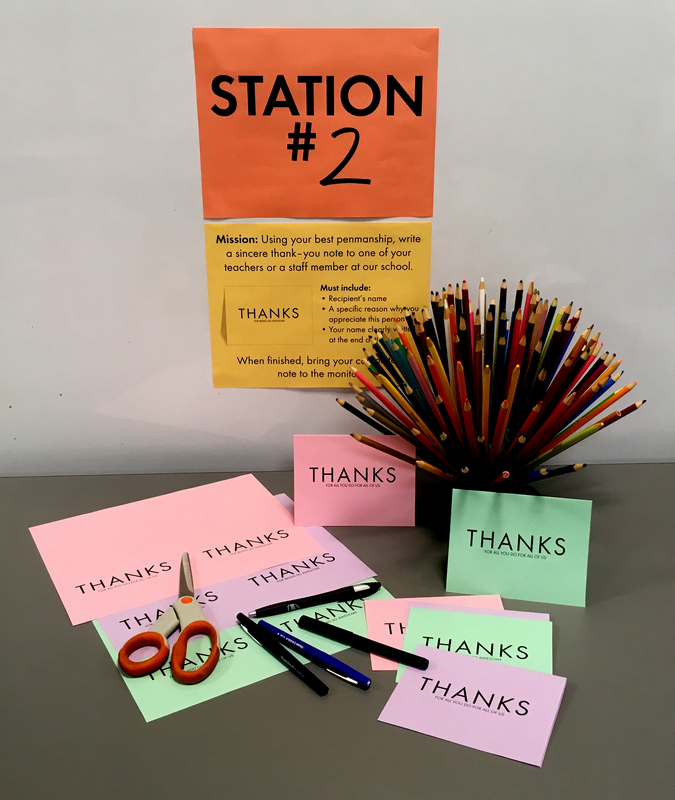 Leave a completed thank-you note as a sample at the station and provide colored paper half-sheets. 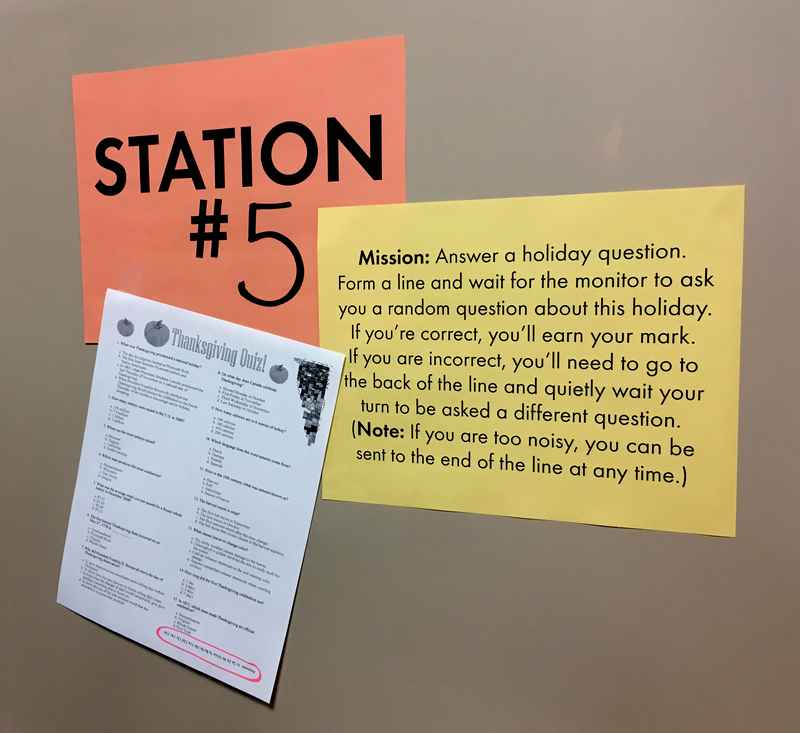 The thank-you notes will be reviewed and collected by the station monitor and, later, dropped into teachers’ mailboxes. Have a student volunteer deliver the notes to the teacher mailboxes after you or another trustworthy adult has read over the notes to check for appropriateness. • Answer a content question. Brainstorm a list of 40 or so content questions from this semester’s work. Leave the list and answer key with the monitor. For my freshmen, the list might include questions such as: name the four parts of an intro. paragraph; name the three parts of a concluding paragraph; name two types of hooks that could launch an essay; explain the difference between tone and mood; correctly define a vocab. word I give and use it in a sentence; name the boy in “Thank You, Ma’am,” a Langston Hughes short story we studied last month; name three works by Edgar Allan Poe; etc. If the student doesn’t answer correctly, she goes to the back of the line and waits her turn to try again. • Answer a random trivia question. Your monitor will need access to a smartphone or tablet that’s running a free trivia app, such as Trivia To Go or Knowledge Trainer. If you can’t use an app in class, you’ll want to print a bunch of trivia questions (make sure they’re not too difficult) and answer key for your monitor. • Answer a Thanksgiving-specific trivia question. Print a question sheet and answer key for your monitor, such as the one here or here. Please note: I haven’t verified the accuracy of these questions. Feel free to compile your own holiday-themed questions via a Google search. • Pick up three pieces of trash and throw them in a trash can to demonstrate good citizenship; thank our custodians for their hard work to keep our campus looking good. Make sure your custodial staff is agreeable to this and give each custodian a marker of the same color. 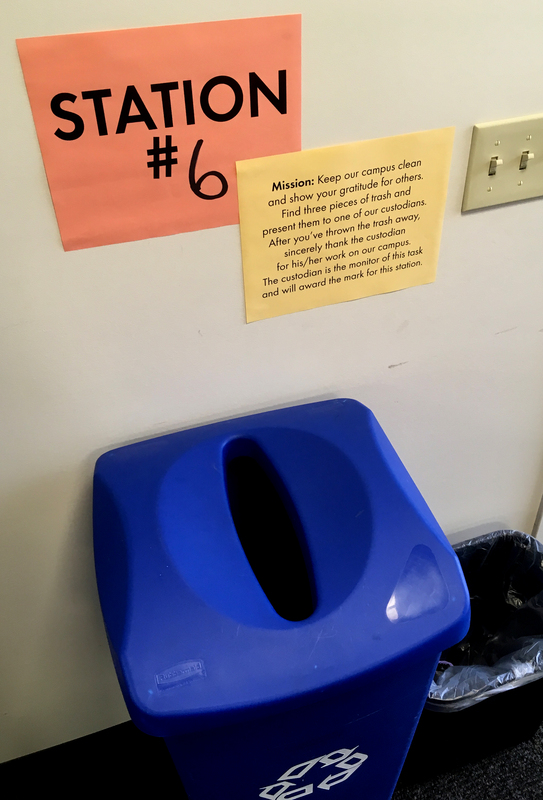 Instruct them to mark the same spot on each student’s hand who presents three items of trash and gives a sincere thanks. • Correctly spell a vocabulary or spelling word. 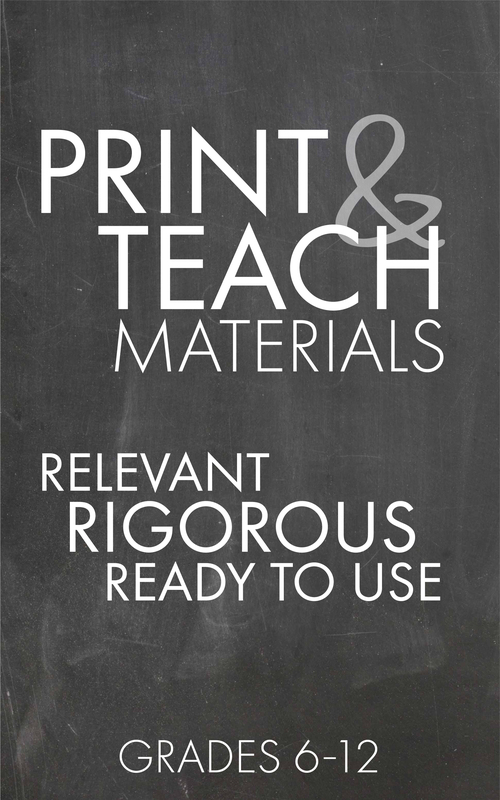 Print a list of your vocabulary or spelling words you’ve emphasized this semester. 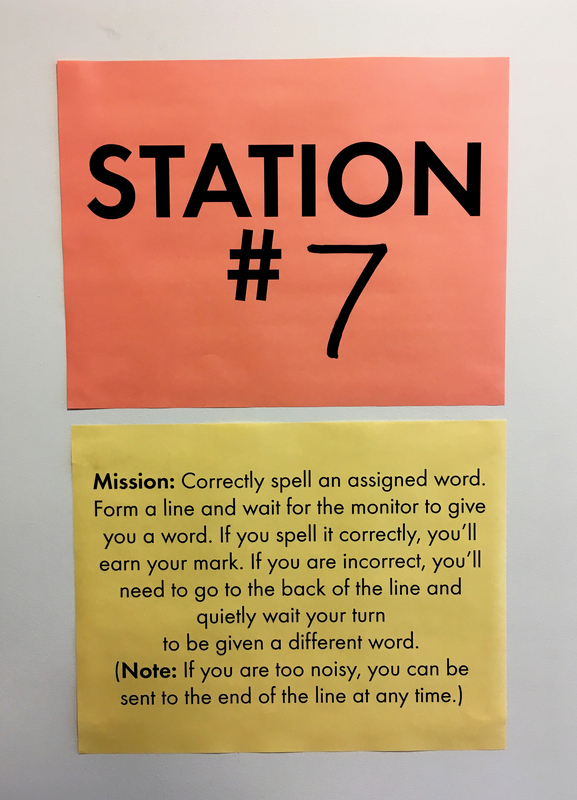 For this station, kids will line up and wait their turn to be given a spelling word by the monitor to correctly spell out loud. If the kid misspells the word, he has to go to the back of the line and wait his turn to try again on a different spelling word. You’ll need a list of at least 40 words. 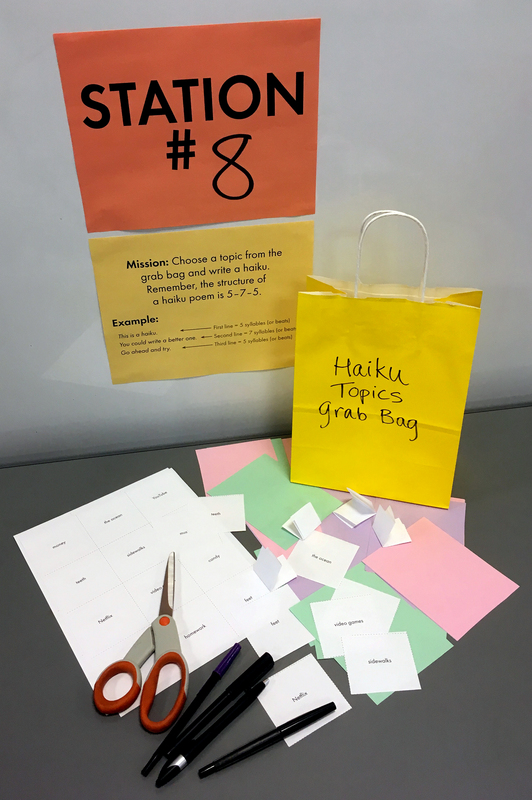 • Write a haiku on a topic drawn from a grab bag. 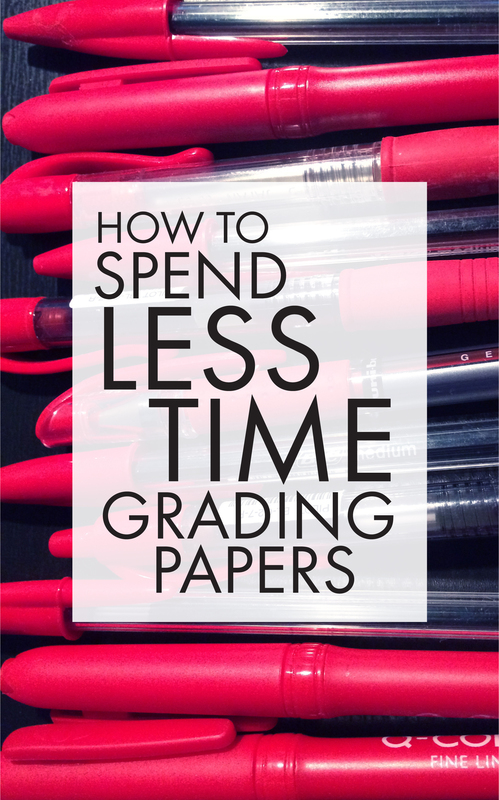 Supply a list of topics and leave colored paper cut into quarters for students to use as they write their poems. Students need to create a correctly formatted haiku and present it to the monitor. Later, you could turn these into a bulletin board, if you’re feeling ambitious. • Correctly edit the three errors in a sentence. (Note: These were designed for my 9th grade students. You may need to create your own sentences if the level is too easy or too difficult for your kids. 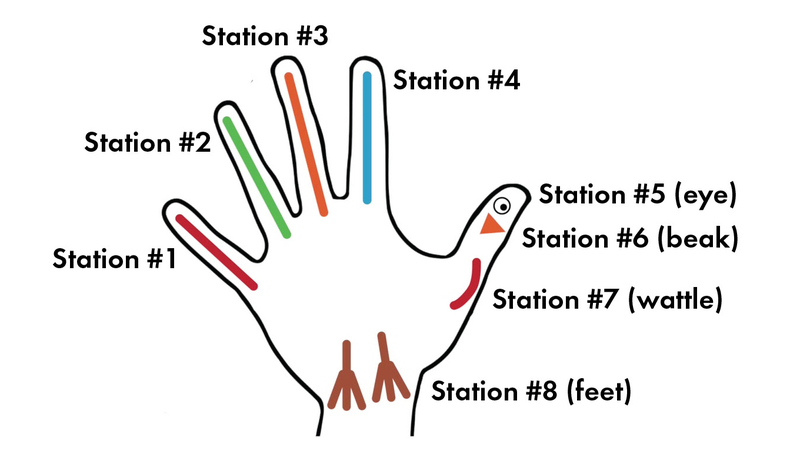 Also, the remaining stations are all marked as “Station #8” because you’ll need only eight stations for students to complete a turkey. No need to set up all 11 stations – just choose your favorite eight and get to it!) 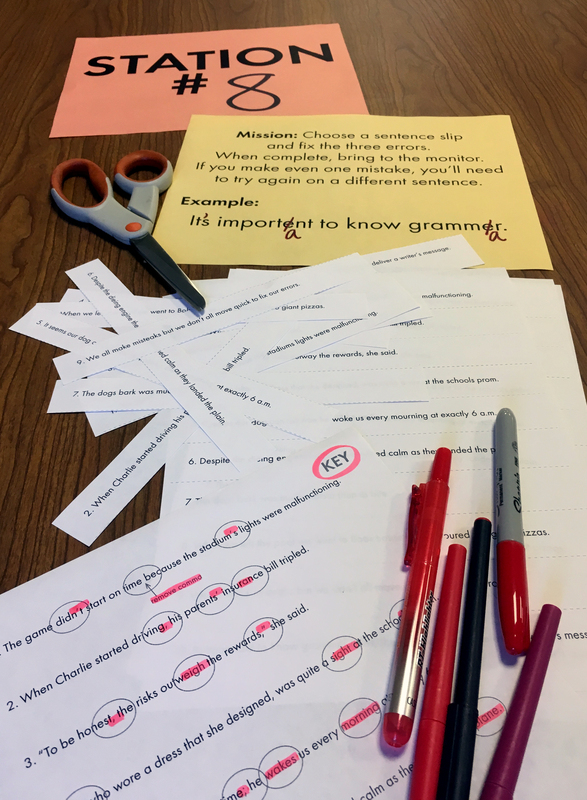 Slice up these sentences and leave red pens at the station for editing. Give the answer key to your monitor. 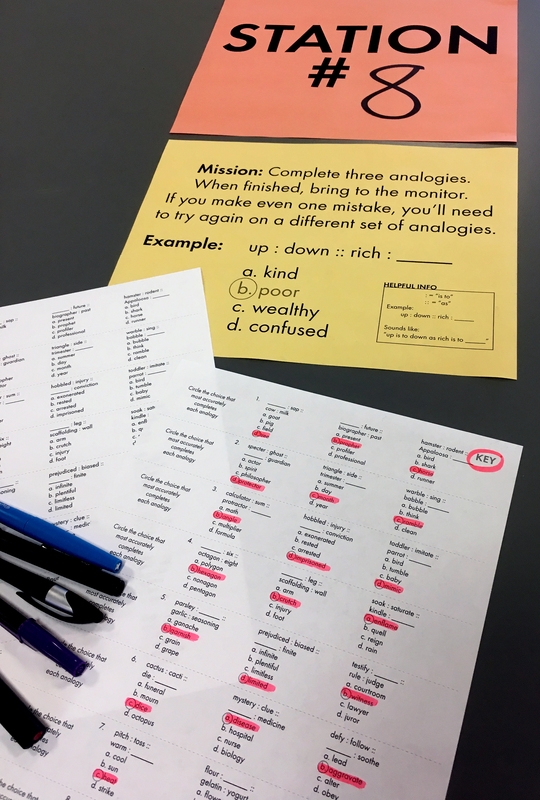 If a student misses any of the three edits, he must choose a different slip and try again. • Correctly complete three analogies. (Note: These were designed for my 9th grade students. You may need to create your own analogies if the level is too easy or too difficult for your kids.) Slice the analogy sheet into strips and leave a key with your monitor. If your students haven’t been introduced to analogies, you may want to present this introductory lecture ahead of time and use the accompanying worksheets for on-going practice. Depending on the level of your students, you may also want to leave a few dictionaries at the station. • Sing the school fight song to the principal’s secretary or any other agreeable adult (teacher friend on prep? cafeteria worker?) on campus. Obviously, you’ll need to get the permission of the staff member to have a troop of students interrupt his/her work. You may also need to supply students with copies of the song’s lyrics. Whew! That ought to keep everyone moving for a class period. (Again, all of the printable station materials above are available here.) If you have any early finishers, I’d ask them to write more thank-you notes, even quietly suggesting that they find something kind to say to some of our grouchiest…um…more reserved teachers. Everyone could benefit from a little drop of sugar during the holidays. Finally, you also could skip ALL of this noisy chaos and enjoy a quiet day of Micro Fiction (two-sentence storytelling) and/or a 43-minute video-based lesson about making the world a better place. Let’s just have some fun with our kids! Okay, everyone, spread the love and share this link with a teacher friend who would enjoy a fun, low-prep day leading up to the holidays. Teach on! I did this last year with my 7th and 8th grade classes and they loved it! They’ve already requested that we do it this year, too. And, my parent volunteers were so excited to be asked to participate in middle school. We no longer have a block schedule, so I will have to work this into 40 mins. Thinking of only having 6 stations. Also, the sentence editing was super difficult, so I’ll use grade level sentences from a piece of work they know. Thank you so much for this creative and fun idea! SO glad to hear this worked for your kids, Kelly! 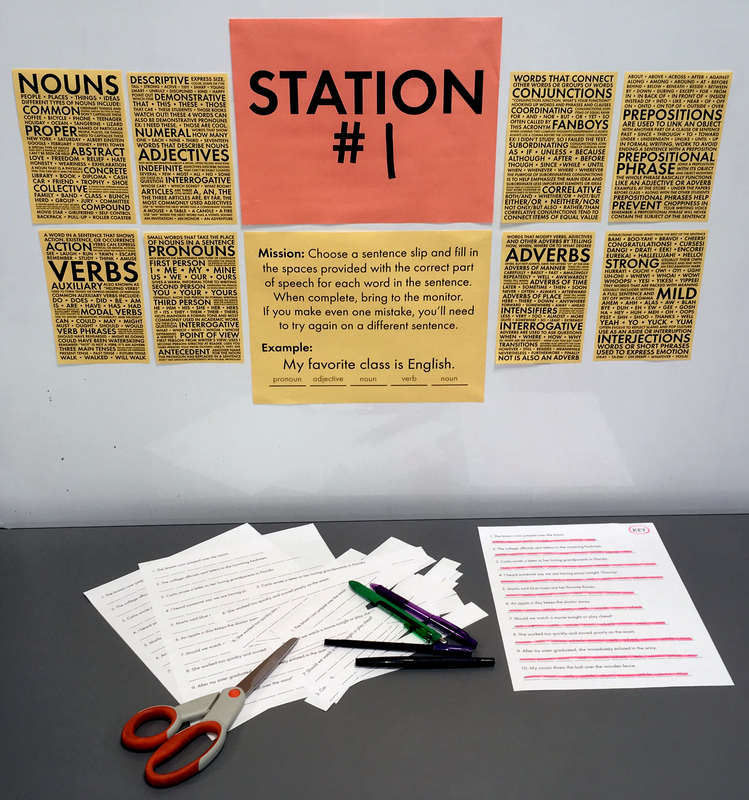 For sure, you’ll want to slice down the number of stations to fit your shortened schedule and, yes, I built everything for my 9th graders so folks will likely need to modify things a bit to fit their particular kiddos. Also, I LOVE that you asked parents to come join the fun – such a great way to build goodwill and a sense of community. Awesome! 03.23.19“Homewrecker” – Would You or Wouldn’t You? 03.04.19Alert! Alert! Your Prezi Links are Broken! “Homewrecker” – Would You or Wouldn’t You? Alert! Alert! Your Prezi Links are Broken! Consistency in the English Department?